When scoring music for picture, it's always worth bearing in mind that time is one luxury that you will rarely have in sufficient quantities. Deadlines must be met; 'writers block' is unacceptable, and a sharp sense of focus is essential (fresh coffee and snacks can be helpful as well). Successful completion of a project will usually entail long hours and working late into the night. You'll need to get along well with clients, and learn to accept criticism and make changes regardless of your personal opinion. Be careful what you wish for, as making a living doing what you love will demand much from you. The circumstances surrounding the scoring of the trailer for The Narrow Gate were a little different than the other films we've discussed. Shortly after completing the score and mix, producer Heather MacAllister informed me that she would be travelling to the Sundance Film Festival, and needed to quickly put together some promotional materials for the film that could be handed out. We agreed that a trailer had to be cut for the web site, and that a DVD with the trailer on it would be helpful as well. However, the film editor was not available, so I tackled the editing job myself. This was just as well, as Heather only had one day available to edit the trailer, have the music scored, and create the DVD! Having previously given Final Cut Pro seminars for Apple Computer, I'm pretty well-versed in the art of video editing, and I'm usually able to move quickly enough to get a job done. However, first I had to digitise the film and select appropriate source clips for the trailer, which took a few hours in itself. Once the trailer edit was finished, I created a Quicktime movie of it and imported it into my sequencer. By this point, half the day was already gone and I had to move fast to create the score. As I discussed last month, this trailer needed to be very dramatic, to generate excitement and interest in the film (you can download the clip with the finished music at narrowgatetrailerafter.mov. 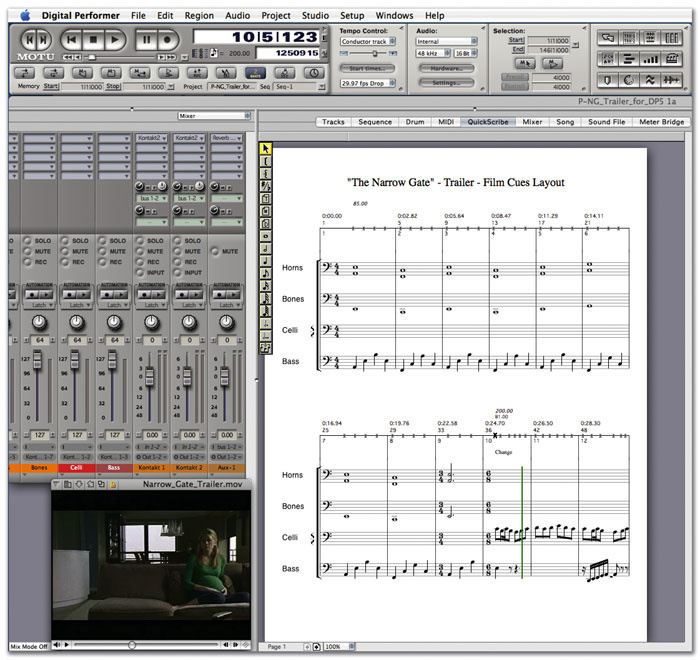 Part of the finished score for the Narrow Gate trailer in MOTU's Digital Performer. 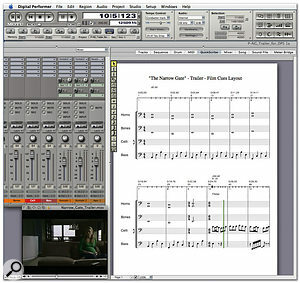 Note that the score is written in on a now-completed version of the Film Cues layout introduced last month.Photo: Reel Voices/Vera Viditz-WardTo get started, I selected a palette of instruments. For dramatic percussion, I loaded the 'Taiko Earthquake' and 'Thunder Ensemble' patches from East West's Stormdrum virtual instrument. Strings were covered by the VSL (Vienna Symphonic Library) Horizon Opus 1 library loaded into Native Instruments' Kontakt. I wanted an ostinato bass line, so I loaded 'KB-6_PZ', a pizzicato bass patch. As I had to move very fast, I loaded a string Multi patch which covered a large enough range; 'VI+VC+KB_Stacc' combines violins, cellos and basses in a single patch with staccato articulation. I knew I would not have time to load the individual patches with more samples layered per note, and I would have to sacrifice the violas for the sake of speed. To give the basses more weight on some low sustaining notes, I also grabbed a patch from my East West/Quantum Leap Symphonic Orchestra Gold library, 'F CBS Big Sus'; I often layer sample libraries together when I need a fuller, richer sound than any one can provide. For French horns and trombones, I went with the Project SAM libraries, loading forte patches '23 HN Sustain F' and '30 TBN Sustain F'. Finally, I added a tam tam and, from the VSL Opus 2 library, a sustain flute ensemble patch 'FL-3L_Sus'. As I discussed last month, composers usually prefer to work in private, and present only finished pieces for review. In this case, though, as with last month's Ghost Soldier, the client was sitting right next to me in the studio. The clock was ticking and there was no time to be shy; I just had to jump in and start scoring. Since we needed to open the trailer with something dark and ominous, I scored the French horns and trombones at the lower end of their ranges (see the screengrab of the arrangement on the previous page), playing sustained whole notes against a quarter-note bass ostinato line. Astute readers will notice a similarity between the bass line here and the one used in The Destruction Of Civilization, the film I scored and used as an example in parts 5 and 6 of this series; in fact, it's almost identical. Scandalous plagiarism ...not! No one ever accused the Beatles of ripping themselves off by reusing a I-IV-V progression on the guitar, and the bass line is, after all, just a supporting element here. When you have little time to compose, you'll often have to draw upon whatever works to get the job done. End of story! To add to the ominous character of the opening bars, I added a soft taiko drum hit on each dissolve. The placement from scene to scene was a little inconsistent, as I wanted them to land on a beat and in the black for maximum impact. It almost sounds like two simultaneous time signatures happening, which is a musical effect I like. At bar 10, the pace quickens, as the shots move inside the apartment of the central character and the viewer witnesses her growing terrorist paranoia. Staccato cello lines take over here, and are overlapped with slightly confused flutes to further emphasise the characters' state of mind. A low bass line also comes in to set us up for our next section. Notice that despite the changes, I don't have more than three musical parts playing at once — I'm observing the 'Rule Of Three' that I discussed in part 6 of this series. At bar 18, the pace picks up even further, and the dramatic build to the finish line begins. The French horns make a dramatic entrance, while the basses play a fast moving staccato line that is doubled and tripled by the cellos and violins. The string textures thicken, and at the point where the picture goes to black, the tam tam and taiko drum sound and ring out. To push this a little further, I added a horn glissando from VSL's Epic Horns library, 'Ho-8_Gliss_12_Up' to lead into the percussion sting. It's a bit of a cliché, but very effective! As I've mentioned previously, I'm really a guitar player with dreadful keyboard technique, and playing this last section in real time without quantisation was a challenge for me. It didn't help that the client was sitting next to me, hearing one embarrassing attempt after the next. Time was getting short, and we needed to wrap up so that we could move on to the DVD. So I politely explained to the client that I would prefer to put some headphones on and turn the speakers off. Once that was done, I proceeded to slow the tempo down until I could play it just right. That went very well, and when finished, I put the tempo back up to the original speed and played it for the client, who was extremely pleased. So whatever works to get you to the finish line is fair game! I bounced the mix and assembled the DVD in Apple's DVD Studio Pro. Once that was accomplished, I created a smaller-sized Quicktime movie for the web site. It was a long day, but by the end of it, we had a suitable film trailer, a dramatic music track, and a happy client. All in a day's work! Until now, I've focused on dramatic films destined for cinemas, and now it's time to change gears a bit, and turn to the world of television, and to a documentary in particular. It is not uncommon for documentaries to require a degree of authenticity that is not always called for in the cinema; there can be less flexibility for artistic licence with the score, for example. Documentaries often require the music to be representative of a particular locale, or even a specific period in history, in addition to accommodating the subject matter. In the case of the next film, the director had some very specific musical requirements. One area that we have not yet touched on in this series is work contracts. I'm not a lawyer, and would prefer that you seek legal advice regarding contracts from appropriate professionals, but a few of my thoughts on the subject might prove helpful. Every job opportunity often requires a different approach. For much of my television writing, where most of the clients have come about as a result of long-term relationships, contracts are rarely written up. The same is true with music houses that I've worked with for many years. Verbal agreements regarding terms and budgets are common. I think it is a general rule that the more money is involved, the greater the need for some contractual agreement in writing. When the project you're working on is going to be broadcast on major networks, contracts are required for musicians as well. Some independent films I've scored, on the other hand, have proceeded on a handshake. For others, a simple contract was drawn up after speaking with the client. And for a few others, it was necessary to have a lawyer review the terms. Use common sense when proceeding in this area. It certainly doesn't make sense to get all worked up and hire a lawyer for a low-budget job with a first-time filmmaker. In the case of Dinka Diaries, producer Filmon Mebrahtu presented me with a fairly detailed contract stipulating ownership, delivery dates and compensation. When dealing with films that are funded, especially by private or non-profit organisations, it is necessary for everything to be done in writing. Don't hesitate to ask questions or request revisions; after all, contracts are designed to protect both parties. On the whole, I have found that contracts are a good thing. As you get higher up the food chain, they can get fairly complicated and deal with royalties, soundtrack recordings, cue sheets, session costs, licensing issues, and so on. Read them carefully, and be sure to specify in writing exactly when you are to be paid. If you don't, you can be sure that it will be much later than you hoped! The documentary film Dinka Diaries was written and produced by Filmon Mebrahtu. It tells the stories of African immigrants living in Philadelphia and their experiences dealing with American culture (for more about the film, see the box overleaf). Filmon was born in Eritrea, located to the East of the Sudan in Africa. In the 1970s, when he was six, his family left to escape the political and civil strife there. In 1984, after attending schools in India and the United Arab Emirates, he arrived in the United States to study electrical engineering in college. After working for a while in wireless communications, he developed an interest in filmmaking, acquired a digital video camera, and began to learn the art of filmmaking. From 2002 to 2004, he participated in the Independent Television Service (ITVS) Mentorship Program, working with award-winning filmmaker Louis Massiah. His most recent films include Stop Killing Taxi Drivers (2001) and Rencontrer (To Meet) (2004), which have been screened at various museums and festivals in the US. His work has also been broadcast on Philadelphia's WHYY and WYBE television channels. In 2005, Filmon was a recipient of the prestigious Pew Fellowship Award for the research and development of his new film project Émigré, which chronicles the experiences of two Senegalese Muslim immigrant families over the period of one year — one family in Paris, the other in Philadelphia. It is through documentary filmmaking that Filmon seeks to understand his own immigrant experience, while exploring the experiences of others. 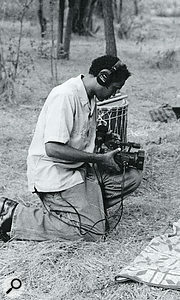 Dinka Diaries producer Filmon Mebrahtu.Photo: Reel Voices/Vera Viditz-WardFilmon contacted me after listening to some samples of music on my web site. When I first spoke with him by telephone, we discussed the subject matter of the film and some specific issues that were of importance regarding the music. We also needed to determine the feasibility or working together, as we were some 130 miles away from one another. We agreed to meet at my studio and discuss the particulars. Distance is less of a concern these days with the advent of high-speed Internet access (more on this in a moment), and we were able to put that issue to rest. The bigger hurdle to overcome was the temp music. Filmon was influenced by the music of African blues guitarist Ali Farka Touré; he was attracted to the blues element of Touré's playing, and felt it would work well to represent the universal experience that the immigrant teenagers in the film were experiencing. The good news was that I play the guitar. The bad news was that I had never heard of Ali Farka Touré before. Luckily, Filmon brought along a few CDs of Touré's music as a guide. While he did not edit the film with this music, he had a few specific tracks that he felt were appropriate, and he asked that I listen to them. So began my education in the music of Ali Farka Touré! But then one of the benefits of working on a documentary film is being introduced to music that you might previously have been unaware of. I grew up admiring the great blues rock guitarists of my generation, but African blues guitar was something a little different. We agreed that a solo acoustic guitar playing in the style of Ali Farka Touré would be the best solution for certain scenes in the film, although it was not important to exactly mimic his style. For other scenes, a string orchestra would be suitable, along with African percussion, the idea being to make the music a significant hybrid of American and African styles. As I mentioned in Part 5 of this series, I like to take on jobs only if I feel that I can handle them. Had Filmon wanted a virtuoso violin to be the focal point of the film, I would have passed on this project, as such a task is beyond my skills, and the budget did not allow for additional musicians. So being a guitar player was the deciding factor for me in accepting the job. What's interesting is that there were few examples of my guitar playing on my web site! Yet Filmon liked what he heard despite that, and in the end, it was a bonus that I was a guitar player. Filmon is something of a guitarist himself, so it was fairly easy to communicate about the specific parts that would be played. Scenes from Dinka Diaries (clockwise from top left): the film explains the background to the conflict in the Sudan which leads to Dinka like Joseph and Abraham coming to the States. Partly guided by audio cassettes of advice from their village elders in their former homes, they begin to assimilate, both into the community of other Dinka based in the USA, and also into wider American society.Photo: Reel Voices/Vera Viditz-WardDinka Diaries is a documentary film that tells the story of three Southern Sudanese teenagers who are uprooted from their homes in the Sudan and find their way to America. In November 2000, Mike Kuch, Abraham Kuol and Joseph Deng, all under 18, arrived in the city of Philadelphia. Two years later, they collaborated with Filmon Mebrahtu to document their experiences as they assimilate into American society. The goal of the film was to allow immigrant communities to participate in the creation of the media that tells their story. Through a combination of video diaries shot by the young men themselves and scenes shot by their teenage peers and filmmaker Mebrahtu, the film provides an honest and thought-provoking account of the complexities of acculturation. The film was shot in Mini DV format, and edited by Mebrahtu on a PC using Adobe Premiere Pro. Dinka Diaries was produced in association with various organisations in the US, including ITVS (the Independent Television Service) and NBPC (the National Black Programming Consortium), was co-produced with Philedelphia Public Broadcast channel WYBE, and was funded by the US Corporation for Public Broadcasting. The Internet has certainly changed our lives. Faster speeds and cheaper prices continue to improve our ability to communicate and exchange files with clients. For years we've been able to exchange small MP3 audio files via email, but it's only recently that it's started to be practical to send video files around electronically, as the file sizes are so much larger. However, clients usually prefer to hear the music in context, with the visuals, and there are now a few solutions available to us to make this work. The first thing I do when I'm ready to present a piece for review is bounce the mix with the picture to a small Quicktime movie file, usually sized at 320x240 using the MP4 codec. This gives me reasonably good-quality audio and video for review purposes. This size may be small enough to email, especially if the scene is under a minute in length. However, some mail servers reject attachments larger than 5MB, and almost all email hosts limit the storage space available. Another method of delivery is to post your clip on your web page, and email your client a link to it. This avoids email-related problems, but requires you to have a web page, plus the knowledge of how to use web-design software, so it's not always the best alternative, particularly if you have lots of files to send, and scant time to send them in. What's more, this method won't help if your client needs to send you a revised video file quickly; some degree of two-way communication is desirable here. You can connect with your client via iChat or instant messaging and send the file that way, but that assumes your client is available to be on line. And I have found that the latter solution, while it gets around the file-size limits, is very slow. 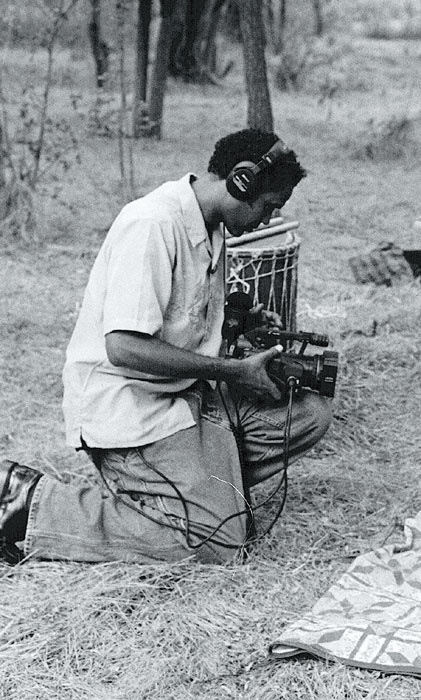 Filmon Mebrahtu (with camera) working on an interview for Dinka Diaries.Photo: Reel Voices/Vera Viditz-WardFor me, the best solution has been to use an FTP (File Transfer Protocol) server to exchange files. There are Internet file-transfer services that host these, or you can get one yourself. I have found Yahoo's Web Hosting to be a cost-effective solution, although there are many others as well. For US$12 a month I get five Gigabytes of storage, a web domain, a web site and email. I create a directory that the client is given password access to, allowing them to upload and download files at their convenience. One extremely important thing to remember when using FTP transfers is to name your files appropriately. You can't use any illegal characters, such as dashes and commas, and you mustn't leave spaces in the name, although it's OK to use an underscore ('_'). Be sure to use the standard 'dot-and-three-letter' file extension after the name. For instance, don't just name your movie file 'my_masterpiece' and post it to the FTP; instead, if it's a Quicktime Movie, name it 'my_masterpiece.mov' to be sure the file won't be garbled by the server. And be sure to add '.mp3', '.aif' or '.wav' to your audio files as well. Using this method, I've been able to upload very large audio files for clients to review or for post-production houses to download for mixing. And at times when a critical last-minute change is made to picture, the client can upload the fix to the FTP for me to download, so that I can make suitable changes to the score. It's a cost-effective solution that allows you to work from home and with clients anywhere in the world where there is high-speed Internet access. For Dinka Diaries, I would bounce each scene to a Quicktime movie, post it to my FTP server, and then send Filmon an email advising that the files were ready to download. He would review them, then call me on the phone to give me his thoughts. This allowed us to work remotely for the majority of the work. It also facilitated his sending me a revised cut for one scene, as well. Most of my clients prefer this method, as it means they don't have to attend sessions, and yet they are able to communicate feedback and receive revisions almost immediately. This box just goes to show how opinions can vary in the world of music production. Hilgrove Kenrick, who wrote the first half of this series based on his mainly UK-centric, television-oriented experience of music for picture, advised you to compress and limit all of your finished music to within an inch of its life before finally submitting it to your clients. Whilst I agree that this is reasonable practice when you're one of several people pitching for work, and you're trying to make your material stand out (by dint of it being louder), it's not something I'd advise for completed submissions. So why the difference of opinion? After all, when preparing music for compact disc release, most composers nowadays mix their music as loud as possible, and levels are then often maximised, leaving virtually no headroom. Why should music for picture be different? Well, in film and television an entirely different set of circumstances is at play. In addition to the headroom needed to accommodate broadcast transmission (broadcast levels in the States do not usually rise above -10dB on a peak meter, to take one example of this), audio mixers must accommodate dialogue, sound effects and location sound as well as music. Consequently, I think it's best not to normalise your mixes, and avoid heavy compression or slamming your tracks with a peak limiter unless it is an essential part of your track's 'sound'. Post-production mixers will only have to lower the level of your track, so you might as well save yourself the trouble. There's another reason why I think you should go easy on the dynamics processing with your music-for-picture work. I do lots of film and television mixing myself, and when I'm performing this role for clients, I know that I prefer to have the option to add any compression or limiting myself in order to make the track fit better in the overall audio mix. A track that is over-compressed or heavily limited might have to be pulled further back in the mix than was originally intended; remember, in music for picture, dialogue is king. And that's why I think that budding composers should let mix engineers do what they do best, while the composers stick to composition. I'm going to cover three scenes from this film. The first contains the background information that introduces the three boys from the Sudan dinkaphotosbefore.mov. As is common in documentaries, this scene consists of a number of still photographs that dissolve into one another, accompanied by narration. Filmon and I decided that I should score this scene using guitar and string orchestra, and in particular a nylon string guitar. The idea was to create a piece that was sympathetic yet not overly sentimental. As there is dialogue, it is important not to score a piece that would be too distracting. The second scene follows one of the youths walking around the city of Philadelphia while listening on headphones to an audio cassette made by the elders of their former village, which imparts wisdom and advice to help them as they make a start in this new land: villageelderbefore.mov. We hear the voice of the village elder speaking in Sudanese, accompanied by subtitles. It is here that Filmon wanted the blues guitar influenced by Ali Farka Touré (if, like me, you've not previously heard of him, try searching the Internet for samples, or look at your local library for his recordings). Filmon and I agreed that I would use an acoustic guitar, and I would play two parts in a conversational style, with the two guitars symbolically representing the youth and the village elder. Having the subtitles gave us a little extra breathing room for the music here, as viewers normally focus on the subtitles when hearing a foreign language. Despite this, though, you should be careful not to step on the voice. The third scene involves a map, and can be downloaded for you to watch from dinkamapbefore.mov . Maps are frequently found in documentaries, providing background and perspective to the story being told. In this case, it is through maps that the filmmaker explains the background to the conflict in the Sudan, the reason why the three boys in the film emigrated to the USA. Filmon and I agreed on strings and percussion here, both pitched and non-pitched. While the maps take us back to Africa, the music is not required nor intended to be of any particular African style. There is a voiceover, so you should be restrained in your scoring. Also, the maps represent the passage of time. The music should not plod along, but have some rhythm and movement to reflect that. You'll notice that the clip begins before we see the map. It is very common to overlap your score with the scenes before and after, allowing for a smoother transition. In this scene, the three young men are travelling by train from Philadelphia with their friends to meet with the Sudanese ambassador in Washington DC. The music should begin on the cut to the window looking outside the train, and continue to the scene where they arrive and get into a taxi. If you're up for the challenge, download the movie clips, do a little research, and brush up on your guitar skills. And if you don't play guitar, consider collaborating with a friend who does. After all, if you're planning a career in music for picture, you'll have to handle a situation similar to this at some point. Next month, in the final part of this series, we'll take a look at how I scored each of these three scenes. Appropriately, we'll also talk about scoring the closing credits to a film — that is, if the producer hasn't already inserted a pop song written by his nephew!